The Arctic sea ice is melting at a record rate. April 10, 2018—–There is no doubt that Planet Earth is warming relatively fast! Data supports this allegation. The data supporting global warming include biological, geological, hydrological and climatological. The year 1880 has been established as the beginning of a period of accelerated warming due to the increased use of fossil fuels and a growing population. From 1880 to 1979, the global temperature increased 0.1°F (0.05ºC) above the pre-industrial average. By 2016 the global temperature had climbed 1.4°F(0.6ºC). The warming of our planet is not the same from place to place over the surface. With the possible exception of Antarctica, the continents are warming faster than the oceans. The main reason is the difference in specific heat between land and ocean. The specific heat of a substance is the amount of energy it takes to raise the temperature of one gram of the substance 1°C (1.8ºF). The specific heat of water is used as the base for measuring specific heat and has a value of 1.0. The specific heat for some other substances are ice=0.5, air=0.24, and sand=0.19. The significance in the difference in specific heat is that a given unit of energy will raise the temperature of earth materials about five times as much as a unit of water. Thus, land surfaces warm faster than water when an equal amount of energy is added. 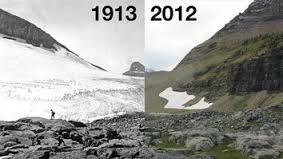 Climate normals are periods of 30 years that move forward every 10 years. The current normal being used is that of the period 1980-2010.When compared to the 30 year global average for the period 1980-2010, the northern hemisphere is warming faster than the average for the earth as a whole. It is also warming faster than the southern hemisphere. The Northern Hemisphere temperature increased more than two degrees Fahrenheit. The reason the Northern Hemisphere is warming faster than the southern Hemisphere is due to the fact that most of the earth’s land mass is in the Northern Hemisphere. The Arctic is the coldest region in the Northern Hemisphere. The region consists of the sea surrounding the North Pole and land that rings the sea. 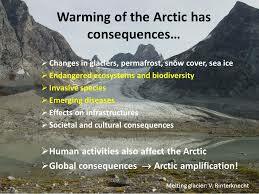 The arctic is warming faster than mid-latitude or tropical regions. It is warming more than twice as fast as the average for the earth. The reason for this is that as ice and snow melt on the fringes of the arctic the ratio between reflection and absorption of solar energy changes drastically. In the winter the sea is covered by a veneer of ice and the surrounding land is generally covered by snow. With the onset of summer, the increased solar radiation results in the melting of ice and snow melting off the land. 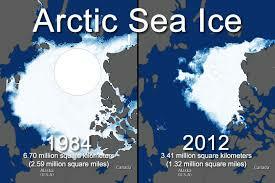 The more snow and ice that melts, the faster the arctic warms. This change results in what is known as a positive feedback mechanism. More and more energy is absorbed rather than reflected or used to melt the ice. As the melting season lengthens the land and atmosphere above it warm faster than areas further south. While the Arctic is still the coldest region in the Northern Hemisphere, it is warming more rapidly than other areas! Categories: Climate Change, Disappearing Ice Shelves, Sustainable Education | Tags: #climatechange, Co2 and Global Warming, Declining Sea Ice, Disappearing Ice Shelves | Permalink.